Peppy Le Pom Ornamental Pomegranate is a dwarf variety that can be grown in a container. Bamboo Home LED Grow Light Garden is designed to grow a wide array of plants. Purple Boy Hybrid Tomato fruits combine the flavor of heirloom Cherokee Purple with the disease resistance of modern hybrid tomatoes. COLORADO SPRINGS, CO, UNITED STATES, January 28, 2019 /EINPresswire.com/ — The best new ornamental plants, garden products and edible plants have won the 2019 Green Thumb Award presented by the Direct Gardening Association (www.DirectGardeningAssociation.com). Honored in the Ornamental Seeds, Bulbs and Plants division were Illuminati Tiny Tower Mock Orange from Proven Winners ColorChoice Shrubs and Peppy Le Pom Ornamental Pomegranate from Proven Winners ColorChoice Shrubs. Honored in the Gardening Tools and Accessories division were the Vertex Lifetime Tomato Cage from Gardener’s Supply Co. and the Bamboo Home LED Grow Light Garden from Gardener’s Supply Co. Honored in the Edible Plants division were Wood Prairie Organic Colossal Potato Collection from Wood Prairie Family Farm and Tomato Purple Boy Hybrid from Park Seed. Winners of the 2019 Green Thumb Awards were chosen by an independent panel of garden writers and editors. The winning products were selected based on their uniqueness, innovation and potential appeal to gardeners. The Green Thumb Awards recognize outstanding new garden products available by mail or online. The awards are sponsored by the Direct Gardening Association (DGA), a nonprofit association of companies that sell garden products directly to consumers via catalogs and websites. Mock oranges have long been prized for their fragrant flowers in early June. Illuminati Tiny Tower also has lush green foliage borne in a unique “stacked” foliage arrangement that looks like a tower of beautiful deep green leaves. Between the foliage are hundreds of neat white flowers in early summer, spreading the sweet fragrance that has made mock orange a perennial favorite in the landscape and flower garden. Illuminati Tiny Tower has a dwarf growing habit that fits easily into most garden spaces. This plant is disease resistant, deer resistant, cold hardy and easy to grow. Illuminati Tiny Tower is available from www.GardenCrossings.com. Pomegranates are beautiful plants, and they have a fascinating and storied history. But many cold climate gardeners have missed out on the chance to grow them. Peppy Le Pom Pomegranate is a dwarf variety that can be grown in a container and brought indoors as a houseplant, especially in colder climates. This new variety is covered in traffic-cone-orange flowers all summer, which develop into small, round fruits for additional ornamental appeal. Peppy Le Pom Ornamental Pomegranate is the first introduction from plant breeder Megan Mathey. 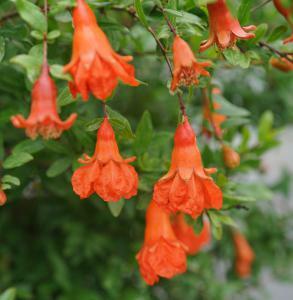 A useful dwarf shrub in garden areas where pomegranate is cold hardy, Peppy Le Pom makes a unique patio plant in colder climates that can be brought indoors for the winter. Available at www.GardenCrossings.com. The Bamboo Home LED Grow Light Garden is a modular system of high-intensity LED grow lights housed in meticulously crafted bamboo frames, which is designed to successfully grow and nurture a wide array of plants. The Bamboo Home LED Grow Light Garden features two modules that can be stacked or used separately. The shorter of the two units is intended for seed starting and growing small plants such as succulents or African violets. The larger unit accommodates taller houseplants. 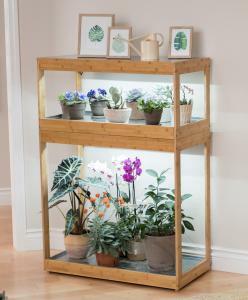 The Bamboo Home LED Grow Light Garden includes rust-proof galvanized trays that are designed to catch water spills. A coordinating rolling base makes it easy to move the modules, and the high-intensity LED lights give plants the light they need at every stage of growth. Available from www.Gardeners.com. 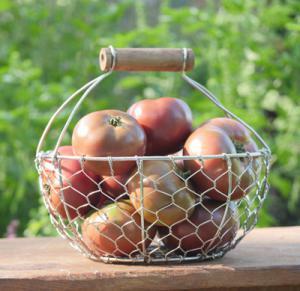 The Vertex Lifetime Tomato Cage is sturdier, more versatile and easier to store than conventional tomato supports. The formed aluminum wires are joined together with heavy duty nylon couplers that allow the cage to fold from flat to open to flat again in seconds. Inspired by the technology behind super-tall skyscrapers, the extra-long wires that sink into the ground provide superior stability, while the cantilever design of the wires allows for the cage to sway with the wind. Where a traditional cage would blow over, a Vertex Lifetime Tomato Cage will remain standing. There are no welded joints that can break, and the aluminum wires will never rust—so this tomato cage will last in the garden for many years. The Vertex Lifetime Tomato Cage and the taller Vertex Lifetime Tomato Tower are available from www.Gardeners.com. The Wood Prairie Organic Colossal Potato Collection is a super-sized seed potato assortment containing all 19 organic potato varieties grown as Maine Certified Seed by the friendly folks at Wood Prairie Family Farm. For over 40 years, Wood Prairie Family Farm has been testing and selecting the very best potatoes based on two essential criteria: the potatoes must taste good and they must perform well under organic growing conditions. The Wood Prairie Organic Colossal Potato Collection includes popular varieties such as Early-Season favorites Yukon Gold and Prairie Blush, Mid-Season varieties Adirondack Red and Huckleberry Gold, Late Season varieties Butte Russet and All-Blue, and delicious fingerling varieties Russian Banana and Rose Finn Apple. All these varieties are traditionally bred, non-GMO potatoes. The Wood Prairie Organic Colossal Potato Collection is available exclusively from www.WoodPrairie.com. Tomato Purple Boy Hybrid combines the flavor of the heirloom Cherokee Purple with the improved disease resistance found in modern hybrid tomatoes. This new hybrid variety can be successfully grown where heirloom Cherokee Purple succumbs to common tomato diseases. Tomato Purple Boy Hybrid is resistant to nematodes, verticillium wilt, Fusarium wilt and tobacco mosaic virus. Tomato Purple Boy Hybrid fruits are beautifully round tomatoes with a delightful deep purple color. The tomatoes boast an intensely rich flavor that offers true homegrown tomato tang! Slightly ridged and very symmetrically shaped, these juicy tomatoes will ripen just 80 days from setting out transplants. Seeds are available exclusively from www.ParkSeed.com.